In the weeks leading to the UN General Assembly, the Kremlin orchestrated a takeover of an unfolding narrative on civil war in Syria. Increasing Russian military presence appeared to only be the start of Putin’s strategy for the region, as more recent statements revealed joint efforts in intelligence gathering by Russia, Syria, Iran and Iraq. These and other developments were showcased to the world at the United Nations General Assembly. 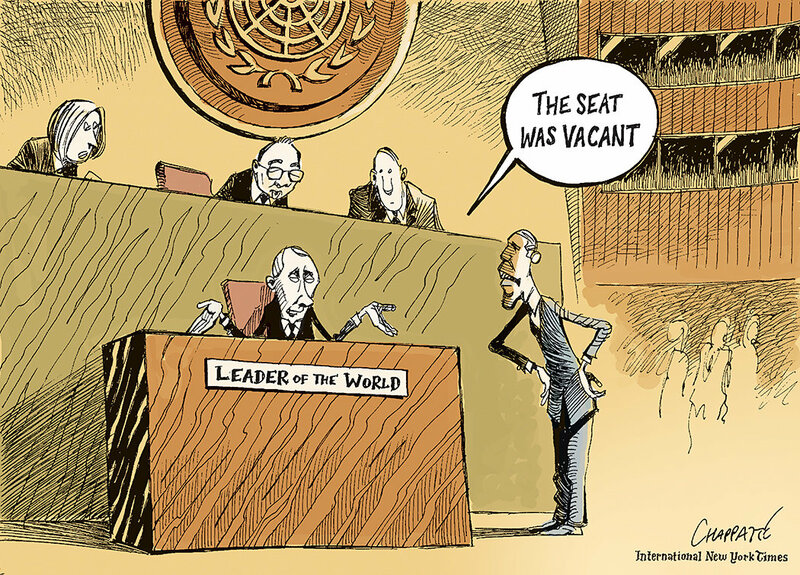 “President Obama and President Vladimir V. Putin attended the General Assembly.” Patrick Chappatte. International New York Times. Lithuanian sources did not pay as much attention to the various contra-positions of Vladimir Putin and Barack Obama at the UN General Assembly. Event coverage mostly revolved around the visible discomfort experienced by the two leaders in each other’s presence. Interestingly, their meeting was reflected in the background of the Syrian crisis rather than the one in Ukraine. Estonian coverage of the UNGA centered on divided discourse of Putin’s strategy for Syria and Obama’s concern for Ukraine. Far more detail surrounded coverage of Putin’s speech, with looming expectations of a bold stance to encourage Western cooperation in Syria. The private meeting between between Obama and Putin attracted disproportionate interest from several sources, as Delfi speculated that Putin sought the meeting after being “blacklisted” in the international community. Iran Nuclear Deal – chance for peace or nuclear threat?